Lowdown: The story of a family surviving the 2004 tsunami. The 2004 tsunamis are one of those events where, just like September 11 before them, I have distinct memories of where I was and what I was doing when I first heard the news. Unlike September 11’s very graphic nature, with the falling towers and the unforgettable images of people jumping to their death, the tsunamis impacts took their time to hit home. 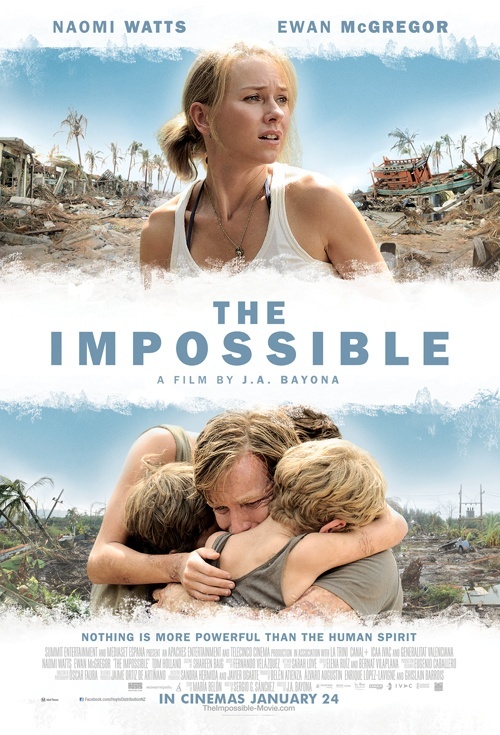 Now the movie The Impossible tries to address this issue by putting us right in the thick of things, looking at events through the eyes of a Western (English speaking) family that happened to be vacating at the wrong place (Thailand) on the wrong time. We join mother Maria (Naomi Watts), father Henry (Ewan McGregor) and their three boys on the plane that will take them to calamity. A similar plane will take what’s left of them at the end of the movie, closing things off in a nice loop; in between we are offered a caption saying all the film’s events are real. We already know what’s going to happen, but The Impossible steps up to the challenge through big time special effects and shots that deliver the massive nature of the message straight home. We see the father and the two smaller boys disappear under the waves and are thus left to follow the mother and the oldest child’s tale of survival. Maria is severely injured, yet despite her son’s protests, saves the life of a stranger: a young – almost baby – boy. But can they survive? At the basic level, there is not much more to The Impossible than the simple story of survival in harsh conditions: finding a can of Coke here, helping out there. As the story unfolds and expands, though, we get to witness plenty of repetitive acts of kindness as survivors and locals try their best. Thus I found plenty of heart warming to be had through The Impossible. I have to add I was wondering all the while whether a similar affair in the USA would gone along similar lines, given people there have guns and seem too trigger happy; there is a lot to be said in favor of Thai culture and how, despite the relatively poor means of the locals, they did their best to help the foreigners they were hosting as well as themselves. The Impossible's story is definitely a story worth telling and it is definitely a story well told, especially given the simple, basic, nature of the acts portrayed here. The two leads are – these guys make me take them for granted by now – excellent in their roles. Yet I found the leads to be my main problem with this movie: given names such was Watts and McGregor’s will not be cast in the lead role for the sole purpose of a five minute performance, a lot of the tension is robbed away from The Impossible. Sure, Maria’s leg looks awful, but you know she’s going to make it till at least the end of the second act. The special effects and the acting, as great as they were, were still unable to suspend my disbelief enough to truly worry about our heroes’ fates. Best scene: The Impossible provides plenty to remember. Two particular survival scenes got stuck in my head – the one where Maria bursts out of the water in slow motion, and the one where Maria is so focused on survival she doesn’t realize she is naked (yet her son still feels ashamed). Overall: The Impossible tries to say that there is hope for humanity given this example of goodness at a time of extreme stress. I will happily embrace this message and give it 3.5 out of 5 stars.